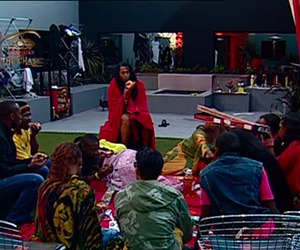 It’s a Saturday and Biggie has extended his grace to the Housemates once again. Today the Housemates are enjoying their food and cool drinks in the garden outside. On the menu are a few snacks like chips, peanuts, chocolates and pizza. The Housemates sat united while they chatted about the things they’ve gone through in the House and Sulu sang for the food while the rest tucked in to the pizza. Because it’s a Saturday, things are pretty chilled and the Rubies are grateful for that because it’s been a long week filled with hard Tasks. This was a nice sight to see where once again the Rubies sat together to enjoy food and each other’s company. The Housemates also teased Maria for always eating just cream. She had to demonstrate how she usually just spray it directly into her mouth, to everyone’s amusement. They all seemed to be enjoying each other’s company. Someone was missing at this picnic but nobody seemed to be bothered? Who could be missing and why? Hakemmmmmmmmmmmm! My vote go 2 u. I loved ur date. I hope what u feel 4 Cleo is real. Go hakeem, go hakeem. Hakem my vote gos 2 u I love u so much!!!!!!!! !